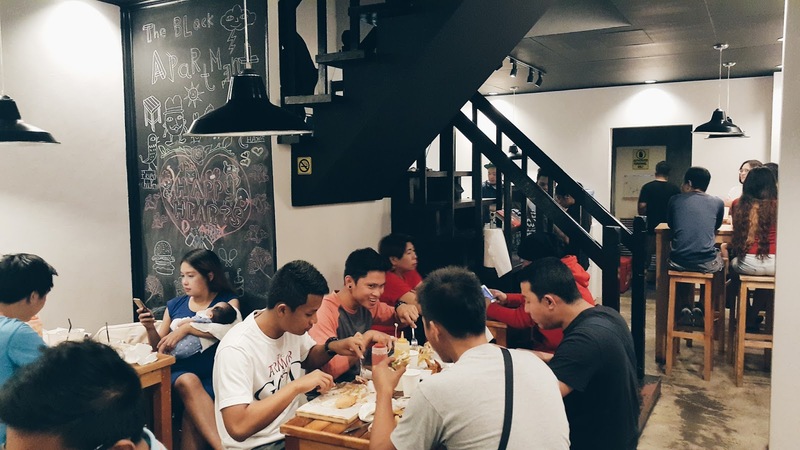 The Black Apartment's been generating quite a buzz in the local food scene of Bacoor that's why it's on our must-try list for the longest time (along with Tarapumwesto in Kawit). And finally, last month, we were able to try their food! Even though I've lived in Cavite all my life, I'm one of those people that still don't know the place (or at least Imus and Bacoor) like the back of my hand. Good thing there's Waze, otherwise, I think we would have missed it since we went there for dinner, and well, the place's facade was literally black. It sure was full house on a Sunday night. Cydell, Cy's sister, made a phone call hours before to ensure that we would have seats when we get there at our appointed time (because she's preggo and we're bringing bibi Jaden along with us). I'm not really certain if they're accommodating reservations or anything to that effect, but when we got there, we only waited a couple of minutes before we were led to our table. So I guess they do? True to its name, it was indeed a part of an apartment complex, though they're only utilizing its first floor. It's a hole-in-the-wall so one should expect the place to small. And it is. Interior's mostly in black and white (walls, stairs, lights) except for the tables and chairs which were wood. About 25 people (I guess) can be seated inside and there's a few extra tables outside. Lucky to be seated by the doodle wall for all my Instagram and blogging needs. Hahaha. 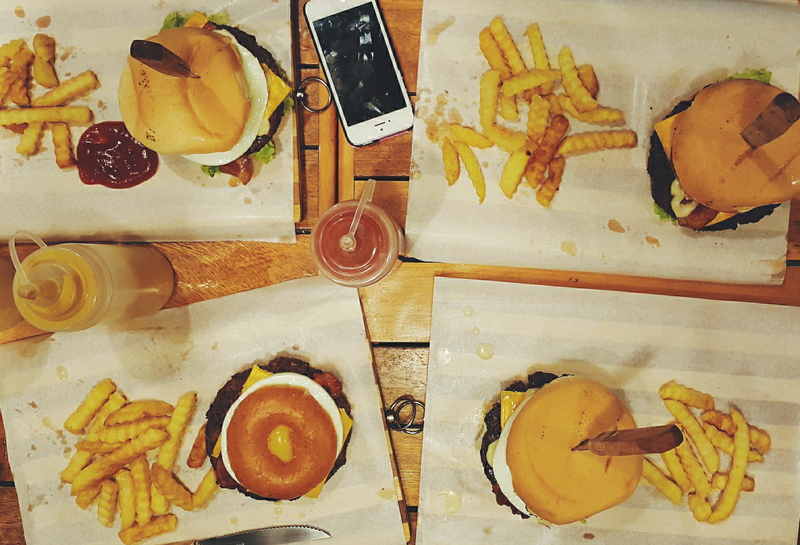 And let me just give them props for the way they present their burgers! I think I've said it time and again that I believe how food is executed's equally as important to how it tastes. 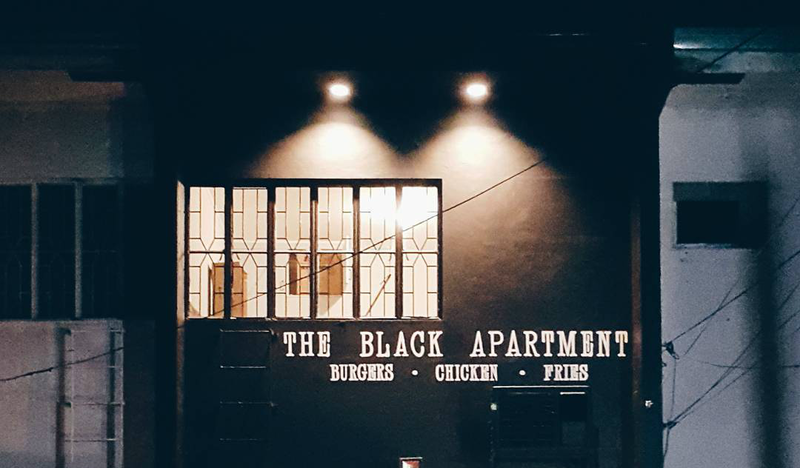 And The Black Apartment is a few of those places that gets this point right. Bed Spacer (PhP 170). 1/3 lb 100% pure beef patty topped with streaky bacon and egg, infused with cheese, the signature TBA sauce, fresh tomato, lettuce, onion, served with fries on the side. Full House (PhP 210). 1/3 lb 100% pure beef patty topped with Spam, crispy bacon, infused with cheese, signature TBA sauce, and served with fries on the side. 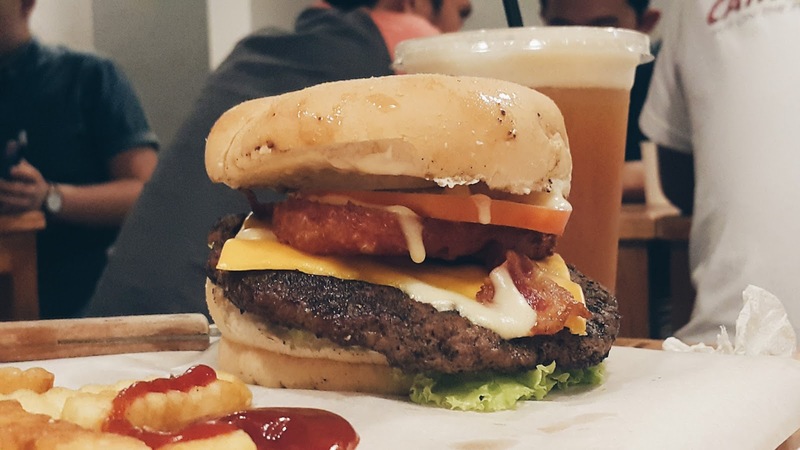 I was stoked when I saw the Hole in the Wall burger! I've been looking forward to trying the outrageous donut burger since I saw one in Offbeat a few years ago. Unfortunately, Offbeat's The Collective branch in Malugay closed and I never knew any other restaurant that offered this. When I saw this on their menu, it was my automatic pick! My mom would go ballistic if she saw me eating this meaty, calorie-filled slump of food (but YOLO lol). Halved glazed melt-in-your-mouth donuts instead of regular buns, 1/3 lb pure beef patty, a sunny side up egg, strips of crispy bacon, a slice of cheese and their signature TBA sauce, all served with fries on the side! It was perfect because it's something I've never tried before, breaking all the rules of what's sweet should remain sweet and what's savory remains savory. 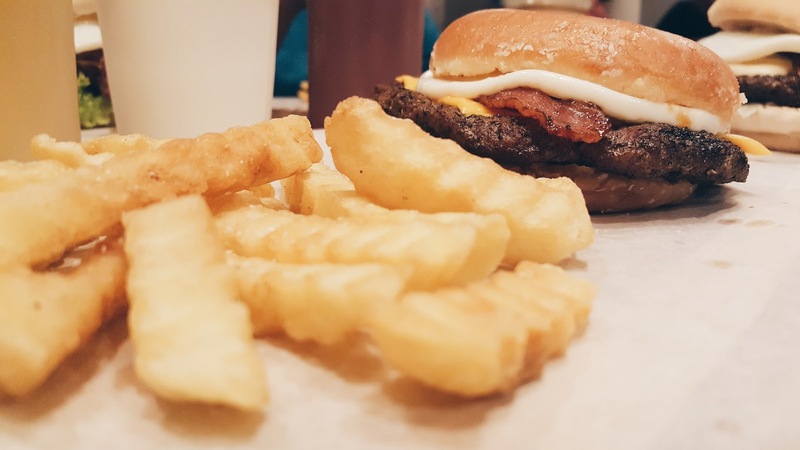 It's only logical to put cheese and bacon on a burger patty, an egg is kind of going out on a limb, but using glazed donuts as buns, let's admit, is leaning towards the cray. It was quite a mess to eat being the burger patty's too big for the donut buns, so like the proper lady I am, I chowed it down with a knife and fork, but halfway through, I ditched the utensils and got my hands all greasy and sloppy. Not in the photos is the refreshing mango lychee shake that I just can't get over, and I found to be the perfect pair to this sinful meal! Don't forget to try that when you're in The Black Apartment. Of course, I wouldn't recommend you eat something like this everyday for obvious reasons, but if you're up for a meaty challenge and would like to try something of both ends of the taste spectrum, it's worth the trip! I think this may be the best burger I had this side of town!